Waldlaufer Liz 376001 women’s velcro sandal. 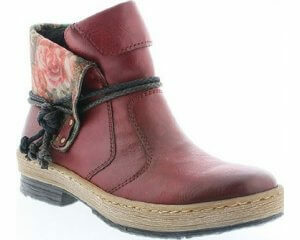 It features a soft metallic leather upper with a decorative elastic strap. The velcro fastening over the instep and the easy popper fastening around the back of the heel allows for adjustability and a secure fit when walking. Great for those ladies who need a wide fitting sandal as Waldlaufer Liz is a wide H width fitting. As with all Waldlaufers it has a removable leather insole, a great option for those who wear orthotics as it allows for extra depth. The stylish, chunky cleated wedge sole adds a height boots as well as providing grip and resilience. A beautiful and easy to wear sandal, Waldlaufer Liz 376001 is available in silver and bronze from a size 4-7, half sizes are available.